Troy Stokes Jr. does not have any MLB stats for the season. Fullname: Troy William Stokes Jr. Draft: 2014, Milwaukee Brewers, 4th rd. Graduated from Calvert Hall College (MD) High School, where also ran indoor track ... Won the 55-meter dash during the MIAA championships as a junior ... Committed to the University of Maryland prior to signing with Milwaukee ... Started a nonprofit youth baseball program along with his father called Swing 4 More during the 2014-15 offseason.....the focus of the organization is to promote high-level baseball training mixed with academics to help provide young males and females in the Baltimore area additional options when graduating from high school ... Enjoys video games, movies and fishing.....follow him on Twitter (@Troy_Stokes15). Batted .233 with 19 HR, 58 RBI and 19 stolen bases in 129 games at Double-A Biloxi ... His 19 HR tied for fourth in the Brewers organization ... Was a Southern League All-Star.....ranked among the league leaders in extra-base hits (3rd, 48), HR (T4th, 19), walks (T4th, 65) and triples (5th, 6) ... Earned a Minor League Gold Glove Award in left field with just a single error all season ... Following the season played for Aragua in the Venezuelan Winter League and batted .298 with 4 HR and 12 RBI in 28 games ... Was added to the 40-man roster on 11/20. Batted .251 with 20 HR, 74 RBI and 30 stolen bases in 135 games between Class-A Carolina and Double-A Biloxi.....ranked second in the Brewers organization in HR and fourth in RBI ... Was named Brewers Minor League Player of the Month for July (29g, .287, 4hr, 15rbi, 7sb). Batted .268 with 4 HR, 29 RBI and 20 stolen bases in 86 games at Class-A Wisconsin. Batted .270 with 5 HR, 27 RBI and 26 stolen bases in 62 games at Rookie Helena ... His 26 steals tied for second in the Pioneer League and tied for third in the Brewers organization. April 18, 2019 San Antonio Missions activated LF Troy Stokes Jr. from the 7-day injured list. April 6, 2019 San Antonio Missions placed LF Troy Stokes Jr. on the 7-day injured list. 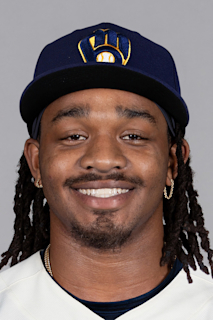 March 13, 2019 Milwaukee Brewers optioned LF Troy Stokes Jr. to San Antonio Missions. November 20, 2018 Milwaukee Brewers selected the contract of LF Troy Stokes Jr. from Biloxi Shuckers. October 11, 2018 OF Troy Stokes Jr. assigned to Tigres de Aragua. April 3, 2018 LF Troy Stokes Jr. assigned to Biloxi Shuckers from Colorado Springs Sky Sox. February 23, 2018 OF Troy Stokes Jr. assigned to Milwaukee Brewers. September 6, 2017 LF Troy Stokes Jr. assigned to Colorado Springs Sky Sox from Biloxi Shuckers. July 27, 2017 LF Troy Stokes Jr. assigned to Biloxi Shuckers from Carolina Mudcats. April 2, 2017 LF Troy Stokes Jr. assigned to Carolina Mudcats from Wisconsin Timber Rattlers. August 24, 2016 Wisconsin Timber Rattlers activated LF Troy Stokes from the 7-day disabled list. August 16, 2016 Wisconsin Timber Rattlers placed LF Troy Stokes on the 7-day disabled list. May 2, 2016 Wisconsin Timber Rattlers activated LF Troy Stokes from the 7-day disabled list. April 13, 2016 Wisconsin Timber Rattlers placed LF Troy Stokes on the 7-day disabled list. April 4, 2016 LF Troy Stokes assigned to Wisconsin Timber Rattlers from Helena Brewers. June 17, 2015 LF Troy Stokes assigned to Helena Brewers from AZL Brewers. June 14, 2014 LF Troy Stokes assigned to AZL Brewers. June 13, 2014 Milwaukee Brewers signed OF Troy Stokes.